On February 23rd, the Silverbacks tweeted confirmation that explosive winger Joao Johanning Mora would be returning for this coming season. 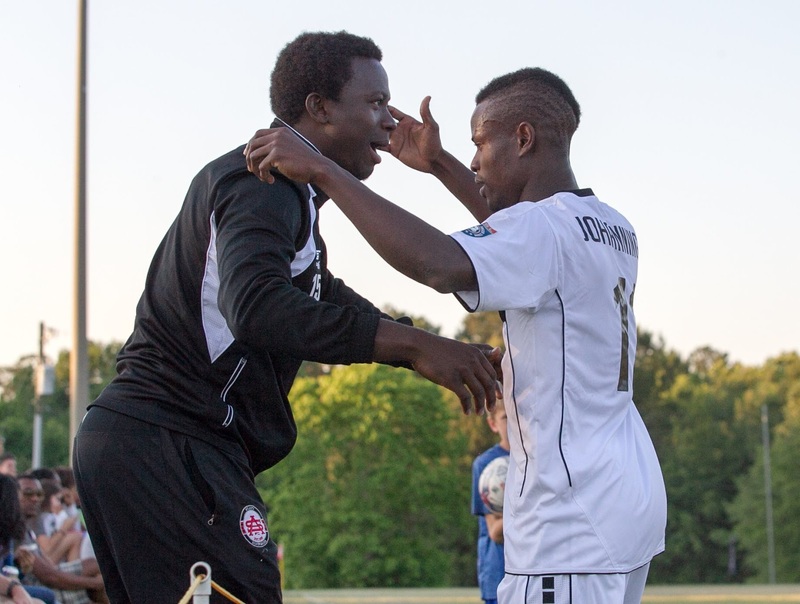 Joao, who started in all 8 games and scored 7 goals last season and was voted 2016 Player of the Year by Silverbacks fans. 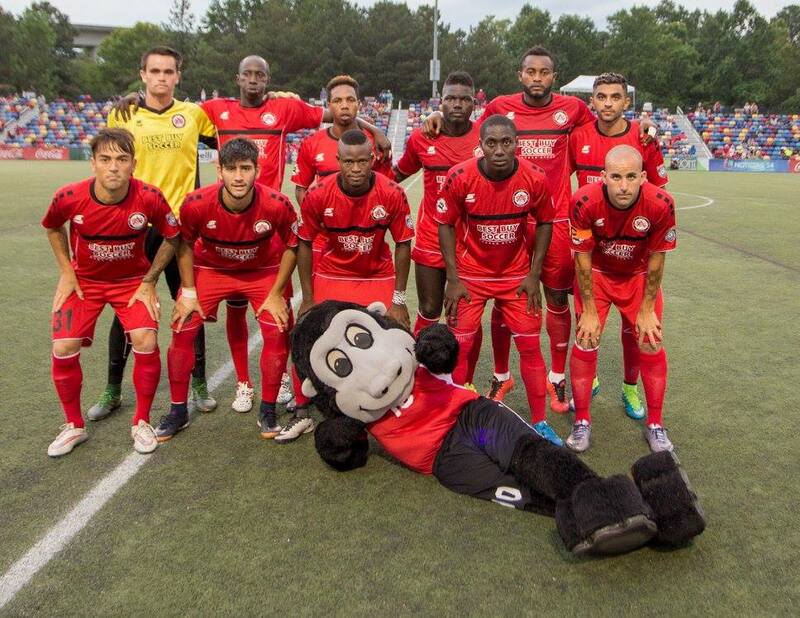 Joao made a fantastic first impression to the fans that would later vote him as Player of the Year in the first game of the 2016 season against Georgia Revolution when he scored the second of three goals by the Silverbacks on the day. The good impressions continued throughout the season as he not only scored goals but consistently provided a creative spark and ran around opposing defenders like they were traffic cones. Joao was arguably at his best in two games against Carolina Discoveries and Carolina Railhawks NPSL when he scored a brace against the Discoveries, as well as a goal against the Railhawks. In the same game against the Railhawks, Joao also provided the assist on Avery Shepherd’s game-winning goal. After wrapping up the regular season with a Penalty that he both won and converted against Tobacco Road, another goal against the Revolution at home, and a goal against Myrtle Beach at Ashley Booth Stadium, Joao had scored a goal against every team in the South Atlantic Conference. If that wasn’t enough, he also scored a goal in that 4-0 thrashing of the Railhawks Reserves in Lawrenceville. Simply put, Joao Johanning Mora is one of those players that has that “wow” factor to him because he’s always doing something that makes fans get out of their seats. It was only fitting that he be the first player to be officially announced for 2017. Player announcements starting to happen is another sign that the season is right around the corner. Keep an eye on Silverbacks social media for more announcements, as well as Planet Of The Backs for analysis of said announcements. 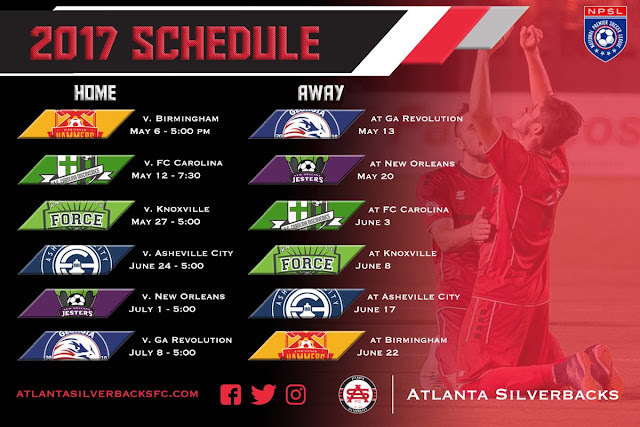 At 12 pm Eastern time, the Atlanta Silverbacks Tweeted a sharp looking photo containing the schedule. Now the speculation over and the planning can begin. All home games will be played on a Saturday apart from one Friday night game where the Silverbacks will be hosting FC Carolina Discoveries. Weekday away games include Knoxville Force on Thursday, June 8, and Birmingham Hammers on Thursday, June 22. Away games against Georgia Revolution, New Orleans Jesters, FC Carolina Discoveries, and Asheville City will be played on Saturdays. The Season will start on May 6 at home against Birmingham, and also end at home on July 8 against Georgia Revolution. All Saturday home games will kick off at 5 pm, which may get very uncomfortable for fans and players alike, so my advice is to sit on the West side of the Park because you have a better chance of getting sufficient shading. One way or another, all Silverbacks road games are possibly doable for fans. The Revolution are in the process of moving from Conyers to Henry County, but that’s still a very doable drive. New Orleans is a really, really long drive but many Silverbacks fans are chomping at the bit to make it to New Orleans, taking Amtrak could very well be an option for them. FC Carolina Discoveries play in Rock Hill, SC which is a relatively easy drive up I-85. Asheville is an even shorter drive than Rock Hill and depending on how you feel, you can take the scenic route through North Georgia. Yes, Birmingham away is on a Thursday night but it’s still a very easy drive, second only to Henry County regarding ease. So if you can, by all means, go. A Thursday night game in Knoxville, on the other hand, might prove to be difficult. But I personally will try to do it, and I’m sure I won’t be alone in my efforts. It’s only a 3.5-hour drive up 75, but it goes without saying that if you do wish to go, leave early because not only can 75 be a mess through midtown and Cobb County, but the split between 24 and 75 in Chattanooga can be very slow at times too. Now that the Schedule is out preparations can begin for what is bound to be an exciting season. As of the time I’m writing this, ticket information has not come out. I would have liked to wait until it came out to publish this, but I have to go to my pesky day later, and I won’t be off until 11. However, a source has told me that season tickets will be somewhere near $70. The countdown to opening day is at 78 days. I have a few things planned to help tide Silverbacks fans over until the day comes, so stay tuned and #PoundYourChest because #WeAreAtlanta!